I am really sorry to have to do this to anyone but , Caution to anyone thinking of dealling with Dan Mcllmoyle "FIEROFLYER"
I sent him $550 dollars along with my 3800 wiring harness and computer over 4 months ago. He told me it would be a couple weeks to do the new harness up and reprogram the computer. Although Dan told you a couple of weeks and you still have not recieved anything I wouldn't get too upset just yet. He told me the same thing back in January. I didn't get it until late april but I did get it. He does not communicate very well or give status updates and I know that he just moved as well. He was extremely backed up with orders due to people just sending him harnesses and money orders without even talking to him first. Try getting ahold of him on (I think this is it) gtfieros.com you might get better results. There are two resistors wired into the stock harness (one a few feet from PCM connection, the other near the ICM). Do either of these have to be kept? Those are not resistors.. Some of the stock 3800 harness had diodes to prevent noise feedback ( spikes ) to the PCM. They are in the AC comp circuit. You also might be confusing a splice pack with a resistor. There are ground splice packs, pink wire switched 12 volt, and 5 volt reference. http://www.fastfieros.com still doing wiring too.. Ya I think your right about the splice packs. They are both located on ground circuits. I guess I will just chop them out and free up those last few tangled wires. What is done with the abs connector wires? There are two red 8 or 10 awg wires and 13 or so small wires in the other part of the connector. I seemed to have missed this in the guide above. The ABS wiring with its connectors gets removed on the Fiero swap including wires for traction control going to the PCM. All 3800 EVAP sensors can also be removed as well and just feed the Fiero charcoal canister with a vacuum source off the engine. Wiring for the oil level sensor can also be removed unless you plan to add in an extra warning light for that. That extra connector has wiring for the ABS wheel sensors and such going through it as well as other wiring that is not needed. Nothing to do with the ABS or traction control is used when swapping the 3800 engine into the Fiero. Just remove all wiring for these two systems completely. 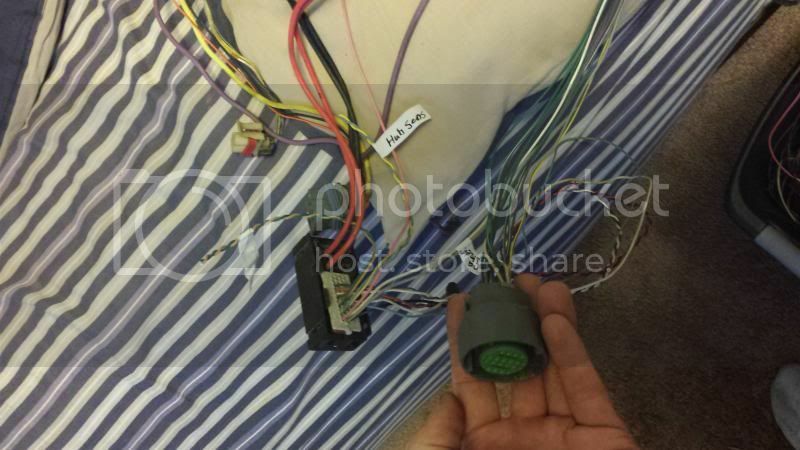 For the electronic cruise control control only wire from the PCM you need to use is the VSS out put every thing else gets connected to the column switch through the old Fiero wiring and the wire that the PCM controlled the cruise with gets grounded. This is Pedro R. I have tried to contact you regarding the hardness I sent you to get either modify for a auto or just simply swapped for an auto. I have sent you a few emails asking you status on it, but I have not heard back from you. More than 15 days have gone by since you told me that it was ready and that you just needed confirmation of my address. Since then I have not heard back from you. I just need to know if it was mailed or not. If you are having any issues with it, let me know, but keep me in the loop. Thanking you in advance for your prompt response. The couple year old manual harness you had purchased that I was nice enough to take back and exchange for an auto one at my expense was shipped quite a while ago. So lets see I am out shipping plus the cost of an 04 PCM that was very hard to come by this time of year and my gas and time looking for one and you are,,, you know what forget it not going to go there and no longer going to do this kind of favours any more. Don't get so upset if I had to post here to get you to answer a simple email, but I had to due something about your careless lack of response. If you had any extra expenses I told you to let me know about them. All I asked from you was to keep me on the loop, to call me or simply send me a message. I strongly recommend that you reconsider the way you communicate with people, specially when we have to put out a great amount of money and trust that one day we receive the service we requested from some unknown, unreachable, and untraceable person behind an email account, and to make it ever worse, from a different country. I FINALLY received the hardness and although I have noticed that it needs a few modifications to say the least, I am thankful for swapping it for me. At least I will not be starting from scratch. I think you said it best when you insinuated saying "let not go there". See my point is simple this is a topic to help people make their own harnesses not to whine I did this to help not unlike taking an old harness as trade and you were informed that I was having trouble finding an 04 PCM for your harness so any time not spent answering you I was at many different wreckers searching when I could have been doing other things and as for your harness it is built as you requested so your little insult suggests which is kind of funny as it means if the harness is not what you wanted then you gave me the wrong info now time to grow up and let this stay as a topic to help others not whine about your own problems so let it go you got your harness with every thing and it did not cost you so where is the problem. The time I spent searching through snow banks at wreckers could easily been spent on other peoples parts but instead I did yours instead now that was my mistake. So like I said let it go. can someone post a few close ups of the c203 connector. I'm working on an auto 3800sc swap into my manual 2.8 fiero. I found the c500, but unclear what one is the c203. Do we need to do anything the large connector that goes into the firewall from the fuel pump? I think I have one of your harnesses Dan(PO installed) but he removed everything to do with the AC(compressor, relay, hoses, condenser, evap, collector). Now Im looking to add the AC back with a 3800 compressor but there are no wires coming from the harness that I can see. Any help would be appreciated. Ok, explain this to a total newb on engine swaps. If I were to take an ENGINE, a WIRING HARNESS and an ECU out of a Bonneville, or Grand Prix, why is all this extra work required? I'm thinking there a few things that simply wouldn't go anywhere... like ABS. A couple of new connectionswhich would obviously be different in the Fiero, like hook up to turn the electric radiator fan on. What am I missing? Why do I need to spend a million hours redoing the harness, or paying someone 500+ bucks to do it for me? Not trying to be a smart a$$, just don't know, what I don't know. Ed- where do you want to put the PCM? I suppose that you could mount it in the engine bay like the first swaps were done. Then all of the wires for start, run, tach, B+...could be spliced in the engine bay into the original Fiero harness that you cut 12" from the firewall and tape spliced. I think if you are going to take the time to do the harness you will also learn a tremendous amount about how the car works. You still will have to do custom exhaust and engine mounts. If you spent the time to make it look good everywhere else why not make the electrical look good to? Each swap is different and you can make it your own way. So Dan, are you still making harnesses ? I'm picking up a running 02 GTP and want to swap it into my 86 5spd Gt. Thanks for the thread and tutorial. So maybe I missed it but I'm having a little trouble being sure where the 4 wires from the fuel pump relay go, and the plug from the hd gtp trans with the 2 12guage wires/ not sure where all the wires from this plug go. And one last thing, Fieroflyer you said there is one wire for cruise control that comes from the pcm that just gets grounded, do you know what pin it is? I'm using pcm and wiring harness from 98 gtp and the trans is from 98 gtp to. Thank you. Oh, does anyone have a link to a diagram for the resistor for the speedo? Thank you for sending the pieces I needed to finish up my swap Dan. Greatly appreciated. Flyer did my harness. Fired right up, plug and play. Thanks again. I would just like to clear up a few things about Fieroflyer. I have been sending him emails with tons of questions and he might not get back to you right away but does within a couple days. He has been very patient with me in reguards to my newbie questions and always gives me the time of day to answer them. Some of my questions have nothing to do with what he builds. I would recommend everyone to ask him for his email address instead of sending a PM over here. It's not my place to post his email addy so I would just ask him through a PM. Once again Dan, thanks for your time and I'm looking forward to doing business with you. I am about to send my harness to Dan. I hear he is the best. He has helped me so much so far via email. Great guy. Stock V6---Stock everything. Trying to keep it 'mostly' that way. But I just got the 3800sc to swap into it!